Tweet, tag, or post your pics of support crews, your Marine Corps runner, spectators, or yourself with #gotyour6. The best photos will grace the pages of RunWashington Magazine in our next edition! Have a story to share about who has your back (or who you are supporting) today? Post a short blurb on our Facebook page from expo to race day and our editorial team just might pick your story to tell to our thousands of followers, fans, and readers. 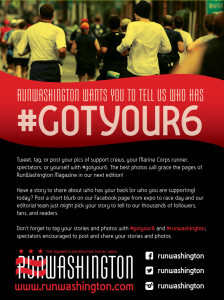 Don’t forget to tag your stories and photos with #gotyour6 and #runwashington; spectators encouraged to post and share your stories and photos.